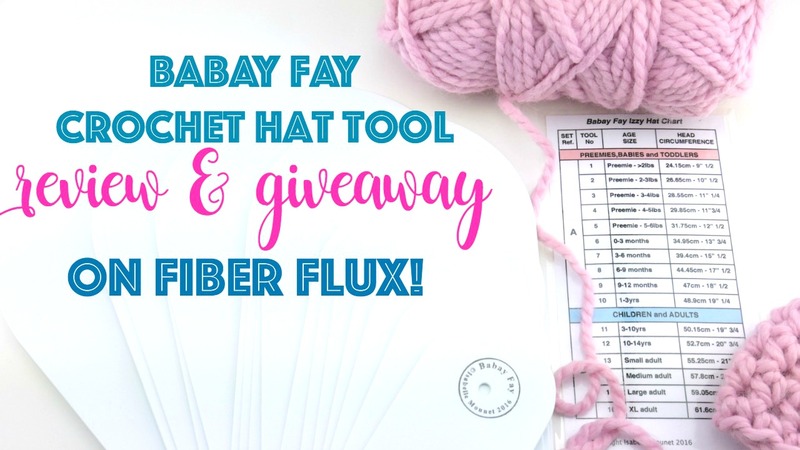 Fiber Flux: Babay Fay Review and Giveaway! Babay Fay Review and Giveaway! Do you love to crochet hats? Perhaps you love to give them as gifts, or as part of your charity efforts too. Recently I was able to check out the Babay Fay crochet hat template too. This is a really clever tool to have on hand to get your hats sized just right. It comes with a sizing chart to look up the size you need, then the templates allow you to size it as you work. Learn more about Babay Fay here! Special thanks to Babay Fay for sponsoring this giveaway! I received a template tool to review and share, all opinions are my own. One winner will receive one Babay Fay crochet hat template tool. No purchase necessary to enter. Giveaway ends July 24. Void where prohibited. Open world wide to entrants 18 and over. Enter to win using the Rafflecopter below (sometimes it takes a moment to load) Now go, go, go, and enter! I have always had a problem with hat sizing - this sounds great. Thanks for the chance to win. This seems like a wonderful tool; I make a lot of charity hats to give to hospitals and I am never sure what size my hats will fit. This will give me an idea so I can make a variety of baby and children's sizes...hope to win! Thanks for the chance! What an awesome tool! Love this! Oh I need this! I'm always making hats for my nieces and I never know if they're going to fit! This would be so handy for the charity hats I do, takes out all the guesswork! I am working on being a charity crocheter. I love to have this tool to help with sizing, especially for the preemie size. Thank you for the give away. That is such a helpful tool! Thanks for the give-away! Oh, this is great for sizing of neonate baby hats. I had tried making them before, and never realized that different neonatal units have differing levels of *how* small are their babies. Hi Jennifer, yes please do some hat tutorials. I'd love to have a hat template tool, such a great idea! This is a neat little tool! Thank you for sharing and allowing us a chance to win. I love the blog and your YouTube channel. Thanks for giving me an opportunity to win the hat template set. It would definitely improve my sizing of hats. Never seem to get the right size when I crochet. This looks like it will be a most helpful tool. I could use this to make hats for the Chemo patients and Pediatric units as well as for my family and friends. Thanks for the demo, Jennifer. What a fantastic tool for hat making! Would love to win the Babay Fay crochet hat template tool! I'm going to be a grandam for the first time soon and would love to start crocheting baby gifts. Thanks so much for the chance to win!!! This looks like a helpful tool. I would love these to help me make the correct size hats! I have made hats that were either too small or too big. These would be a god send! The hat guide is a great idea. Hope I win! The hat guide is a great idea! So excited for this give away! I am always having a hard time with hats either its too big or too small. This is an awesome template. Thanks for sharinshyr gift n passion with the world. Tee hee!!! I love that hat tool!